I had long been a fan of the wines of Hollick, whose Coonawarra wines seemed very elegantly made and less “full throttle” than some others from the region, treading a fine line between New World fruit and food-friendly restraint. I was delighted therefore when their Scottish representatives, The Great Grog Company, invited me to a tasting with owner and winemaker, Ian Hollick. Hollick Estate was established in the 1970’s, an estate winery growing all its own grapes and not buying-in grapes from elsewhere (apart from a little Merlot for their 2000 vintage sparkling red adds Ian). This is a family-owned business, with Ian on viticultural and winemaking duties, and his wife Wendy involved in marketing and their “cellar door” operation of tastings and sales. Though perhaps best known for the Cabernet Sauvignon, Chardonnay and Shiraz wines, Ian is a fan of Tuscan wines, and has been increasing plantings of Sangiovese in 20 hectares of vineyards he owns in nearby Wrattonbully. He is also planting Tempranillo, and clearly is not afraid to experiment with his terroir. They produce around 60,000 cases per year in total, including an outstanding botrytis wine called “The Nectar”, which is a blend of mostly Riesling (around 80%) along with Semillon and Sauvignon Blanc. The Nectar is made every few years, when the conditions for Botrytis cinera, the Noble Rot, are right. Ian says that he sees his two properties at Coonawarra and Wrattonbully as the antithisis of what he calls “Industrial winemaking”. 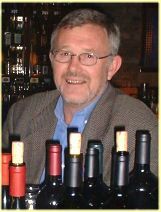 His “Black Label” wines are a fairly recent development; so far a Shiraz, Merlot and a Cabernet Sauvignon made only in exceptional years and in limited quantities. The grapes for these come from selected sites within the Hollick estate. Ian says: “Typically the areas where the terra rossa soil is very shallow over a limestone base”. This results result in lower yields and a crop of small, thick-skinned berries which produce more intense flavours. The Black Label wines undergo partial barrel fermentation and are aged in 100% new oak. The wines are also held in the cellars until they are assessed as ready to begin drinking, though Ian is confident each of these wines will have 10-year-plus staying power. I thought the newest vintages on show here showed a little more weight and power than in some previous years, and that added oomph has not been at the expense of good acidity in the whites, and nicely balanced, savoury tannins and acids in the reds, whilst their medium-bodied elegance has been retained. In all, this is a very impressive portfolio at moderate prices. The tasting was not blind. Prices shown are retail prices from Great Grog, in pounds Sterling (approx £10=$15US). This has a beautifully clean, crisp, pear and apple-fruited nose, washed over by a citrus zest. On the palate it is suffused with waxy, ripe, lime juice flavours. It has quite a rich mouthfeel, with buttery, fat body and perhaps a little residual sugar, but it finishes with crisp acidity and juicy clarity of fruit. Very good. Lots of cut-grass, gooseberry and pungent herbal aromatics, some damp wool and lots of butter. It has zingy tropical lychee fruit onto the powerful palate, shot-through with citrussy acidity and giving an edge to the weight of fruit. Very good indeed. Big, quite Burgundian nose, with a vegetal, slightly cabbagy quality at first, overripe fruit, but all very attractive with a clean white fruit character beneath. The palate is big and bold, with a creamy, vanilla roundness and lots of buttery peach. There’s a fine apple acidity and a little hint of minerality into a long, full finish. Very good indeed. Gorgeous black cherry nose melding into a warming, charry, sweet toasted-oak background with little nuances of briarwood, chestnut and tobacco. On the palate this has plenty of freshness due to good orangy acidity and fine tannins over succulent berry fruit. Nice length, and a really nice Pinot Noir. Very good indeed. This wine spends around 18 months in oak barrels, 25% of which are new, and some of which are “second fill” having been used previously for the top “Whilga” Shiraz. It has a really gorgeous nose; ripe and sweet with mint leaf and eucalyptus, masses of cassis and red cherry and some juicy raspberry lifts the character. Very dense for a 1997. Lovely sweet palate which is flooded with creamy, svelte, and with fine length of chewy fruit. Good balance. Very good indeed. Big toasty nose, with beneath a bright, peppery, raspberry and spice character, with smoky plum nuances. The palate is chewy and full-bodied, with an attack of sweet-edged raspberry and redcurrant fruit, but lovely structure with cedary tannins, spice and sweet oak into the finish. Very good/very good indeed. Huge, fudge-like oaky nose of toast, spice, cream and chocolate, with plenty of sweet, dense black fruit of juicy cassis and mulberry. There are little nuances of woodsmoke and a schisty quality. The palate is creamily dense, with a mass of sweet blackurrant edged with tart black cherry and plum. It has fine focus and balance, with the toasty oak beginning to integrate nicely. Very good indeed/Excellent. Overripe nose of mulberry, super-sweet blackcurrant, hints of mint leaf and black olive, but mostly sweet, thick fruit. The palate is ripe and fat, with freshly crushed blackcurrant, blueberry and bittersweet cocoa and plum. There is a rounded mouthfeel, with charry oak and wood tannins gripping along with decent acidity. Very sweet, concentrated and long. Very good indeed though perhaps more fruit-bomb styled than the Whilga. Gorgeous nose of heavyweight Botrytis; laden with dripping honey, marmalade, quince and dark figgy aromas. There’s a note of burnt orange caramel. The palate is thick and syrupy-textured with terrifically sweet vanilla and lime flavours, a necarine juiciness and lovely balancing acidity. The finish displays more of that toasty sesame-seed oak which will integrate in time. Really delightful and very good indeed/excellent. Tel. +61 (08) 8737 2318.